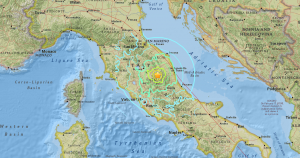 An earthquake of 5.4 magnitude shook central Italy on Wednesday. There were no immediate reports of damage. The earthquake struck in the evening at a depth of 10 kilometers south, with its epicenter in Macerata, near Perugia, the U.S. Geological Survey said. The earthquake was felt in various towns and Rome in central Italy. The earthquake was strong enough to down power lines and jostle loose pieces from buildings, the Associated Press reported. This comes two months after a 6.1 magnitude earthquake killed nearly 300 people in villages northeast of Rome.